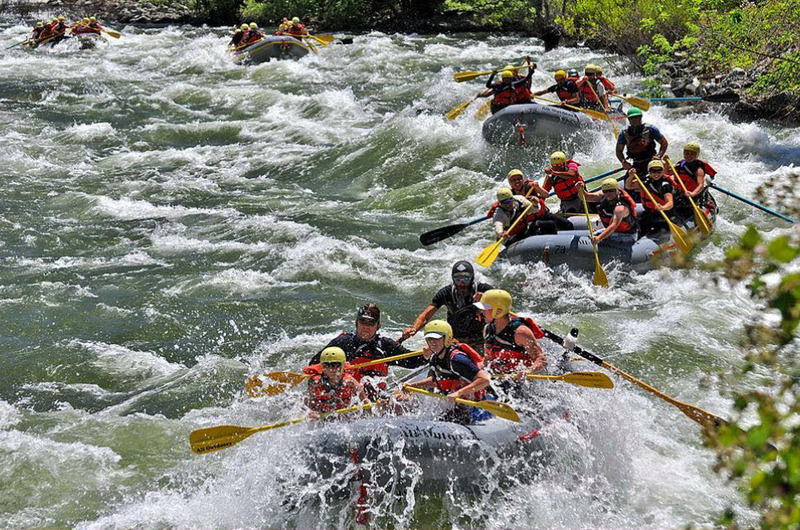 AO Blog > California Rivers: Flows, News, Events > What Do You Need to Know About Whitewater Rafting During The Spring Season? While most people tend to gravitate toward rafting trips during the warmer months of the California Summer, the Spring season months of April, May, and June are a favorite time of year for many of our guides and guests. [Related: Featured Videos: High Water Flows on the Merced River] We want to make sure that everyone that joins us on the river has a great experience, so before you make your reservation with us we encourage you to talk to one of our California river specialists to help you choose a river trip appropriate for everyone in your group. Wait until the summer to take the younger kids. Rafting trips can be a great experience for the whole family, but Spring season conditions may require us to increase our usual minimum age recommendations for each river. These guidelines are meant to help you decide whether a specific trip is appropriate for your child’s level of physical and mental maturity. During the Summer and Fall, normal summer flows and warmer weather provide plenty of river trip options for everyone ages 5 and up. No paddling experience is required. Is this going to be your first time on a whitewater rafting trip? Taken alone, that’s not a problem. Plenty of people go rafting during higher flow rafting trips without having ever been before and have a great time. If this is your first trip, we typically recommend starting on the South Fork of the American River. On our more advanced rivers, previous paddling experienced is recommended but not required. You should be a competent swimmer. In the event that you fall out of the boat, it helps to feel confident in your ability to stay calm and swim actively under your guides direction. You don’t have to be an advanced swimmer, but you should be comfortable in the water and be able to swim hand over hand when the situation calls for it. If you are not confident in your swimming ability, you should go rafting in the Summer or Fall when the rivers are running at typically normal flows. Bring an adventurous attitude. (But it’s ok to be nervous!) Paddlers should be up for a real adventure, including the possibility that you could unexpectedly fall out of the raft in a rapid. These experiences are often the highlights of the entire trip for many people; you’ll find yourself telling stories of how your entire crew fell into the river, and how you helped each other get back into your boat! It helps to come to the river with the right mindset: a positive attitude and an ability to play well with others can go a long way toward making sure everyone in your boat has a great experience. You don’t have to be an athlete. But you should be in good physical health. Rafting is a physically active team sport, and everyone in your group should arrive prepared for a good workout, as well as the possibility that you might find yourself unexpectedly swimming in a rapid. We want to provide everyone with the opportunity to go rafting with us. However, trips during higher Springtime flows may not be suitable for everyone. Furthermore, if anyone in your boat falls out of the raft and into a rapid, your crew must be able to help pull them back in. The heavier the person, the more difficult this can be. In our experience, a person’s height to weight ratio becomes more of a factor for people who are over 200 lbs (especially if they are well over 200 lbs. )Please be sure to discuss the height and weight of everyone in your group if you have any concerns or questions. Do you have any injuries, medical conditions or other physical limitations that may impede your ability to paddle, stay seated in the raft or hold your breath under water without putting yourself at unnecessary additional risk? Note: if anyone in your group has a physical consideration that requires assistance or the use of a prosthetic or other physical aid, special accommodations can be made in many cases with advanced notice before you make your reservation. 3. Are you “Heart & Lung Healthy”? In particular, people who have a history of heart conditions or respiratory issues should confer with their medical doctor before joining any of our trips. Unexpected events (flips, swims, “dump trucks”, etc.) can and do happen occasionally; it’s part of the sport. Physical exertion or stress during these events can exacerbate some medical conditions. Please talk to your physician and avoid putting yourself at unnecessary risk if you believe you have reason to be concerned. Dress for success: Wetsuits are required. Compared to normal summer flows, the water is colder and the weather may vary. Proper attire can make an otherwise cool day more comfortable so you can focus on the fun. Wetsuits and splash jackets are available for rent at check-in on all of our rivers during the spring season if you don’t have your own. For more information, read our post about staying warm on Spring rafting trips. In some cases, our guides may not feel comfortable taking a member of your group down the river with the rest of the trip; when this situation occurs, that person will not be able to participate. We do everything we can to educate everyone about the above requirements in order to avoid situations like this, but it does happen on occasion and it’s never fun for anyone. Please make sure everyone in your group is aware of these considerations both before you book your trip and before they make the drive on the day of the trip. Before You Book Your Trip: Please Talk to Our Reservations Staff! Everyone in your group should be familiar with these considerations, as well as the specifics of the river trip you choose. If you have any questions or need further clarification about any of our trips, we’re more than happy to talk to anyone to help them make an assessment for themselves. Let us know how we can help! We are available by phone, email and Live Chat.